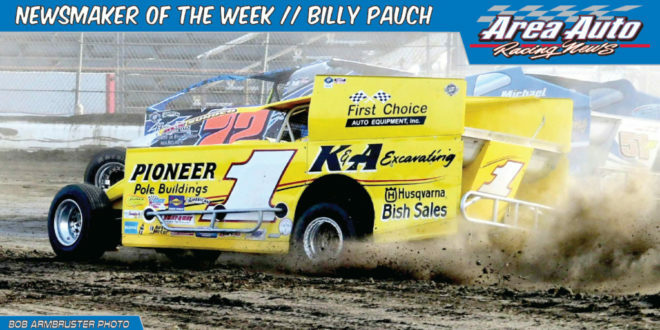 Billy Pauch is flying high, just as he has been for over forty years, as one of the winningest Modified drivers of all time and one of the most popular. Pauch builds and maintains his own cars and races them just as hard as he did when he first got into Modifieds in 1978. At Bridgeport Speedway Saturday, a high speed track that has been good for Pauch in his career, ‘Billy The Kid’ had to make a full throttle outside pass on Davey Sammons to win this one, the classic Pauch move. The win was Pauch’s 732nd career checkered, and a satisfying one at that. He lit up Bridgeport this past Saturday night, making his fans very happy – and making News!